Open repair for aortic pathology requires clamping of the aorta. Aortic clamp time is an important predictor of outcome following open aortic reconstruction. 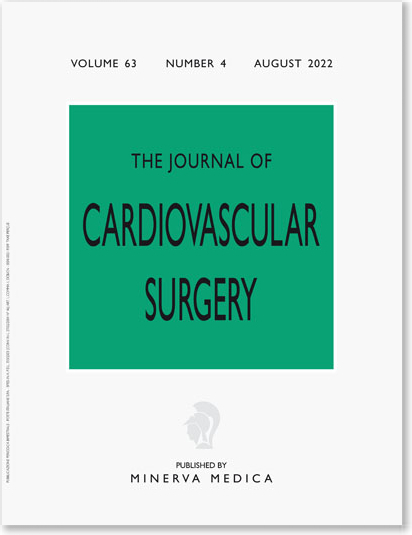 In an attempt to decrease aortic clamp time, an aortic stapler was developed The purpose of this clinical study was to evaluate the performance of the aortic stapler in the creation of a sutureless aorta-graft anastomosis. A single-center, intention to treat study was performed. Data were prospectively collected and retrospectively analyzed. The study protocol was approved by the institutional review board and all patients gave informed consent. Ten patients were analyzed. Patients with infrarenal abdominal aortic aneurysms and aorto-iliac occlusive disease who were candidates for elective, open aortic repair were included. All proximal anastomoses were completed in an end-to-end fashion using the aortic stapler. Time to complete the anastomosis (defined as time required to achieve anastomotic integrity and hemostasis) was the primary endpoint. Secondary endpoints were patency and anastomotic complications (pseudoaneurysm, hematoma, fistula) as diagnosed by duplex evaluation at one month follow-up. The aortic stapler was successfully used in all cases. Open aortic staplers of 14, 16, and 18 mm diameters were used in the procedures. Either woven dacron tube grafts or a bifurcated prosthesis were mounted on the staplers. In all cases only the proximal anastomosis was performed using the open aortic stapler. The distal anastomosis was sutured in a conventional manner using a continuous prolene suture. There were no stapler related deaths or anastomotic complications observed. The aortic stapler was successfully used in all cases. The mean time to complete the stapled proximal anastomosis was 10.2 min (7 - 18 ). The mean number of additional sutures required with the aortic stapler was 1.20 (0 - 6). Mean total aortic clamping time was 50.1 min (22 - 66). Duplex and CT imaging obtained at one-month confirmed the integrity of the proximal anastomosis as well as the patency of the vascular grafts. The aortic stapler can create a uniform staple line between a vascular prosthesis and the aortic wall. It is a simple, safe, rapid and reliable means for creation of a sutureless, end-to-end anastomosis in patients with aortic pathology, however, more patients and longer follow-up are required prior to concluding superiority to conventional suturing.